It was a rough, long winter but we made it through and so did the perennial vegetables. Let the spring feasting begin! Yesterday, I enjoyed a spring meal of asparagus, stinging nettles and parsnip. I’ve also been eating Jerusalem artichokes, dandelions, and horseradish, along with a few salads made from the greens I started inside. 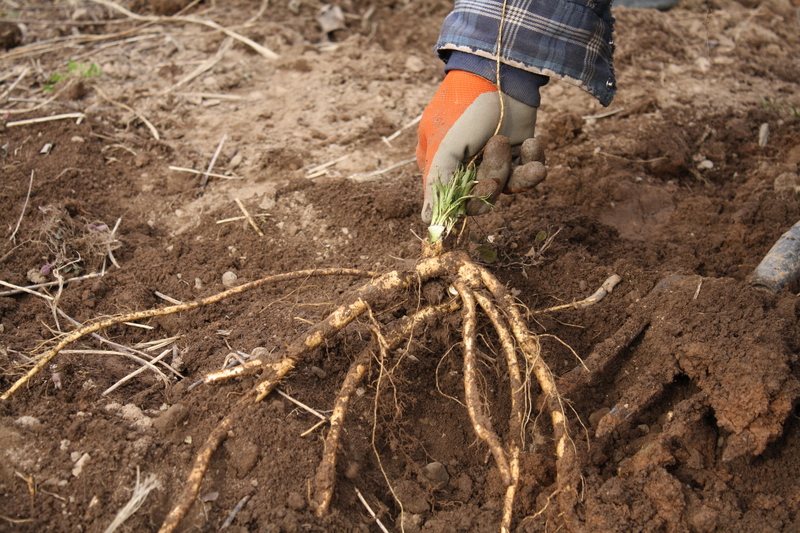 We’re also harvesting crosnes (Chinese artichokes) and apios. It’s great to see the birds return and even see the life return to the garden — such as earthworms. I wrote an article on earthworms for Small Farm Canada a couple months ago and needed pictures. I went around my neighbourhood asking farmers for access to manure piles but they were all covered. Finally I found a few worms in a neighbour’s potting mix and staged the shots inside. Lesson learned: take as many pictures when I can for future stories. Will go back to travel writing now. It’s a foggy day of light rain and I’m thrilled with that — perfect weather for the transplants I set out yesterday and this gives my body a break from forking garden beds.